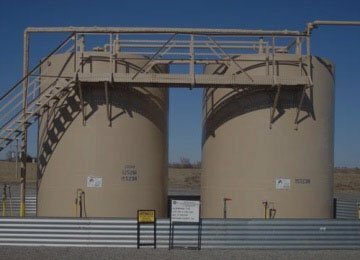 We have vast experience in storage tank inspections and we were one of the first companies to adopt the EEMUA 159 standard when it was first created in the early 2000s. Our comprehensive inspection services and reports are HSE recognised and provides you with the valuable information you need to ensure your tanks are maintained to industry standards. Our experience and expertise across the thousands of tank inspections we have conducted means that whatever type of tank you have, we have well proven inspection methods, procedures and reporting to meet your objectives. We provide a comprehensive range of techniques & services for the inspection of above ground or below ground storage tanks with over 10 inspectors qualified to EEMUA 159. These inspections can be conducted on either in-service or out of service assets and can range from a simple ultrasonic thickness survey to a full out of service EEMUA 159 Inspection. Here are some of the services we can provide as part of your inspection, the majority come as part of a standard EEMUA 159 Inspection. Using either Saturated Eddy Current Technique (SECT) or Low Frequency Electromagnetic Technique (LFET), we can perform a full scan of the tank floor distinguishing between topside and underside defects. The shell can be inspected via ultrasonics targeting various areas including the plates, welds, nozzles and manways. An ultrasonic survey is performed down the total height of the tank at various positions using a remote crawler operated by a technician. Welds are inspected via magnetic particle, electromagnetic techniques, liquid penetrant, UT weld inspection and vacuum testing techniques. Plate condition, roof supports, seal welds, nozzles, vents and handrails. 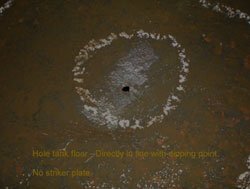 Settlement and tilt checks, corrosion of annular, earthing etc. Bund wall, bund area, plates, welds, brackets, nozzles and pipe work etc. Earthing bosses, venting device, level gauge, level float, dip hatch. Our recommendations are in accordance with the requirements of EEMUA 159 or API 653. You will receive a comprehensive inspectors report detailing the results and the findings of the inspection. Within the report will be recommendations on any appropriate repairs required and recommended inspection intervals, and calculations as per the EEMUA 159 specification.